Zimbabwe, one of the most scenic nations on the south African subcontinent, is home to breath-taking landscapes, a friendly people and uniquely magnificent wildlife. This photo essay shares the sights and experiences of a safari across the wondrous country of Zimbabwe that was conducted during June 21-30, 2001. A den of seven lions chased a giraffe into a cluster of trees through which the giraffe could not escape. 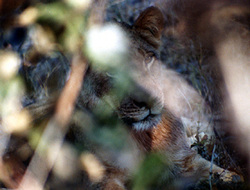 Following the kill, the lions leisurely feasted for several hours before locating a shaded area in which to rest. A female lion is shown guarding the giraffe's remains. Many of these photographs were taken from a windowless land rover, driven by local guides across open terrains. Sometimes the passengers traversed grasslands or weaved through forested trees, and on occasions crossed brooks or climbed boulder covered hills. The wildlife throughout Zimbabwe is wondrous and majestic in its beauty. Elephants, giraffes, impala, wild dogs, kudu, wildebeest, crocodiles and ostrich are found here. The statuesque zebra poises as ready to be photographed by a not so distant observer. Zimbabwe is home to a rich array of mammals, some familiar and others new to those on safari. The African elephant is the largest land mammal, with males reaching a shoulder height of 10 to 14 feet and a weight of 14,000 pounds. The trunk is nearly as useful as the human hand for feeding and grasping objects. The large ears help cool the elephant as they are flapped. 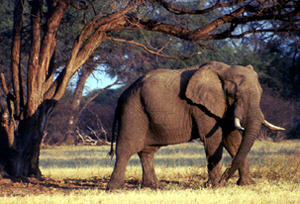 The elephant consumes a variety of plants including green grass and the barks of trees. An adult male can eat up to 650 pounds each day. Although the elephant is more massive, the giraffe is tallest animal with males reaching a height of 17 feet. It's long neck, characteristic pattern and coloring make the giraffe an animal that is mistaken for no other. 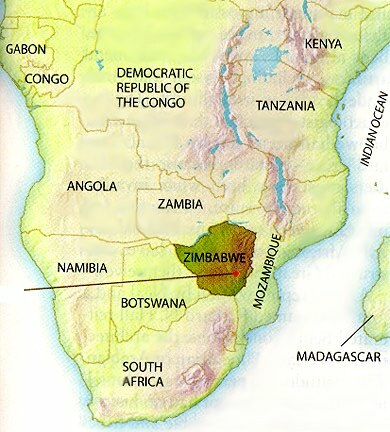 Located in western Zimbabwe. the giraffe typically travels in herds ranging from 4 to 30 individuals. Giraffes rarely eat grass, preferring to use their lips and long tongues to feed from trees and bushes. 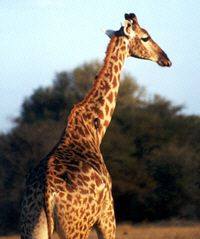 This bull giraffe is darker in color than younger males. The knob-like horns found on the top of the male's head is well developed in this particular giraffe. Extending from Zimbabwe north into Kenya is the Impala, a medium sized and lightly colored member of the antelope family. These grass eaters live in herds in the savanna woodland, avoiding the open grassland where they can easily become prey to predators. There is a black tuft of hair above the hoof, on the rear of the impala's legs. A thin, black line is located down the center of the tail. As impala flee, each raises its tail to expose the white underneath so other members of the herd can follow. The impala ram, or male of the species, is easily identified by the long, gracefully bending horns seen here. 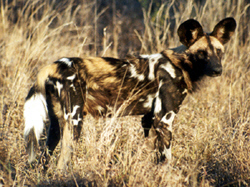 About the size of a large pet dog, with rounded ears and blotches of white, black and yellowish brown, the Wild Dog has a distinctive appearance. There is also a dark stripe between the eyes that extends over the head. Wild Dogs hunt in packs, targeting a variety of mammals up to the size of a Buffalo. 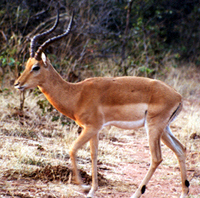 The abundant Impala and Springbok are frequent food sources. The dogs hunt by sight, so they avoid wooded areas and high grasses. 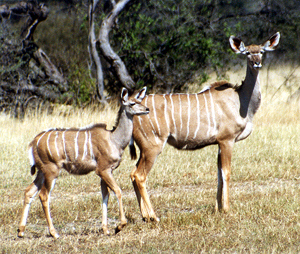 A large, stately antelope with from 6 to 10 characteristic line stripes against a grey-brown body is the kudu. The animal has large, round ears and a bushy tail. The male Kudu, or bull, has a mane from the neck passed the shoulders and long, spiral horns. Founded in wooded savanna, the Kudu lives in herds from 3 to 10 members. The kudu is known for its ability to jump, easily being able to clear a six foot high fence. The photograph shows a kudu cow, or adult female, and her calf. Located in the open savanna woodland and open grassland, in areas where water is abundant, is the Blue Wildebeest. 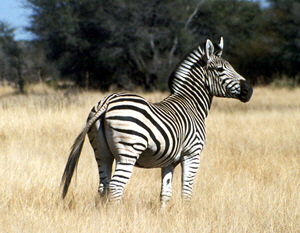 It has a large head with a broad snout, with several dark stripes from the neck to the ribcage. 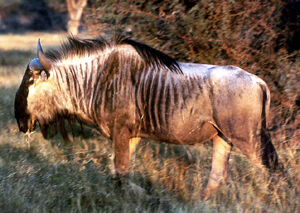 A grazer who prefers eating short, green grass, the Blue Wildebeest have been known to gather into herds numbering in the thousands. The blue wildebeest, which is not blue, can be easily distinguished from the black wildebeest, an animal mostly black in color, by the darker tail color of the blue wildebeest. The ostrich is the largest species of bird alive in the world today. The fully grown male can reach a height of nearly 8 feet of which nearly half is the bird's neck, with a weight of about 350 pounds. The ostrich egg, measuring 6 inches in length and 5 inches in diameter, and weighing 3 pounds, is the world's biggest egg. In Zimbabwe, the ostrich is eaten by people, for its tasty red meat is not unlike that of beef. The birds are breed and raised on farms for just that reason. Ostriches live in flocks numbering to as many as 50. 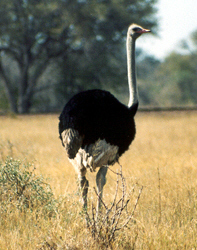 Although the ostrich is a bird, it is not capable of flying. So, it relies upon its two strong legs with unique double toes that somewhat similar to a hoof for mobility. There is no mistaking the majestic African lion, typically tawny in color with the male possessing a long mane. 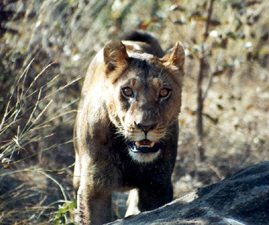 The largest of the African cats, the lion is now found primarily in conservation areas of the continent's southern areas. Lions only attack humans if provoked. Warning signs of aggressive behavior include the lion dropping to a crouching position and producing grunts or growls. This female lion was photographed as she rested in the shade of several large trees after feasting upon a giraffe. A slide show of photographs of the safari in Zimbabwe include enlarged versions of these and additional images.